Digital controller with capability to control up-to four spindle nut runners. Display and controller for strain gauge sensor. 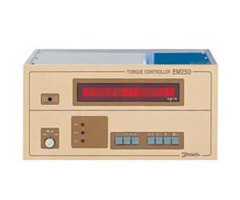 Torque display, "OK" or "NG" judgment, control and data processing can be performed with built-in micro computer. Micro computer displays torque, judges, "OK" or "NG", controls signal and transfers data of each sensor up to 4 sensors in the nut runners. The judgment result of "OK" or "NG" can be transmitted to lamp or external output. Data can be downloaded to PC or printer. The software can easily be modified to meet various requirements. Standard software, display of tightening torque and judgment of "OK" or "NG" are available. However, one spindle is only available for basic hardware, and for additional spindle, the extra board is required. Up-to 4 spindles are available.